Origin: Brazil. 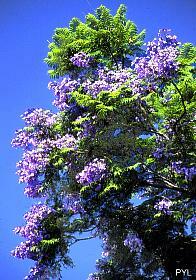 Nice paths of Jacarandas in Southern Africa (Pretoria notably) are met. Habitat: hot regions (South of France from France). Leaves similar to the fern. Purple flowers in the form of glove finger.